Very short – 90 pages – but excellent book. If you’re a fan of sci-fi but don’t get a lot of time to read, get this book, you will not be disappointed. This book follows the protagonist Binti as she sneaks away from her home, something her people do not do, to attend a famous university. She is the pride of her people but also the first of them to be accepted to said university. Despite the stares and murmurs of the majority Binti presses on. What happens next, well you’ll have to read. 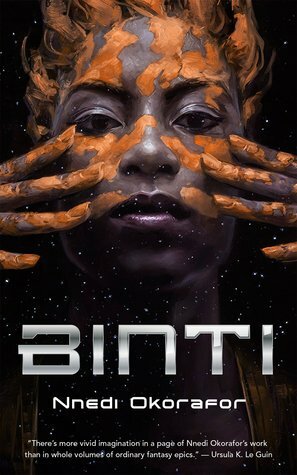 Nnedi Okorafor shows us instead of telling us, what life is like in this time and age. She has created a character that is courageous and adventurous but also unique. The story itself, the structure of it, isn’t so new but the content is original. The events that take place are fresh and original. I could not predict this book as it progressed though my mind tried as it does with every book. This book is full of beauty, science, grand imagination, and ugly realism, subjects we can relate to in our present time. I’ll leave you with the fact that Binti is what’s called a master harmonizer, now think of math as beauty… have fun! I will certainly be reading the rest of this series. Check my 2019 TBR for more upcoming reads and what I’m currently reading.